This is the first book I've read by the author, and it certainly won't be the last. I heard the author talking about the book on Mark Billingham's excellent podcast, A Stab in the Dark. And the fact that the book was set in an area that I knew really well, prompted me to take a trip up the Amazon and click my way into getting the book on the Kindle. What followed was several hours of getting sucked into the story - I finished the book over two evenings, the best part of a bottle of Penderyn and a packet or two of Doritoes. The story is largely told using three concurrent story-lines - one of the narrators is a man in a coma following a crash on the A470 (Believe me that can be a bugger of a road), a self obsessed nurse called Tracy and the main character, Patrick. Though it is Patrick, a young man suffering from Aspergers, who really carries the book through. Personally I know next to nothing about Aspergers Syndrome but the character of Patrick really came alive in the story and I was left feeling that I had a better understanding of the condition. What is interesting, and no doubt testament to the author's skill, is that Patrick is such an emotionless character, and yet he evokes empathy and a genuine affection from the reader. He stands apart from everyone else - the only thing akin to love he ever really knew was his relationship with his now dead father, while his exasperated mother seems if not to hate him, then at least to find him intolerable. Her feelings are perfectly understandable in the context of the story, but then her reasons may be far more complex than they seem on the surface. Patrick is an anatomy student and whilst dissecting a corpse, known as Number 19, he finds something that leads him to believe the man has been murdered. And this is the main thrust of the novel - Rubbernecker is a thriller with very little violence but plenty of scenes that will have the reader squirming. All in all I thoroughly enjoyed this book and immediately bought another by the same author (Black Lands) upon turning the final page. 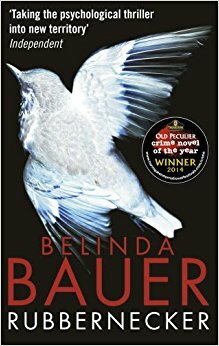 I would recommend this book to anyone looking for a compelling, intelligent thriller and would liken the author's style to the psychological thrillers Ruth Rendell used to produce alongside her more traditional Wexford thrillers.